Jennifer Maiden’s Drones and Phantoms opens with ‘Diary Poem: Uses of Live Odds’, a poem that juxtaposes – in a way characteristic of Maiden’s intensely synthesising work – politics, aesthetics, and gambling. Poetry, of course, is a kind of gamble, one in which the stakes are at once ridiculously low (financially speaking) and ridiculously high (personally speaking). Writing a poem – like any creative act – is a risky venture. One’s subjective experience of being creative never fully underwrites the created artefact. And as a communicative act, poetry runs the ever-present risk of obscurity and/or inconsequence. Maiden’s vigorous response to these poetic risks has been to programmatically, and often comically, confuse basic literary distinctions, especially those between poetry and journalism, realism and fantasy, and confession and fiction. The poems in Drones and Phantoms, as in her previous three collections with Giramondo Publishing, traverse all of these realms across classes of poems recognisable to readers of Maiden: ‘Diary Poems’, fantastic dialogues, and the discontinuous ‘George Jeffreys’ series. The ‘Diary Poems’ knit together apparently autobiographical detail into complex motivic patterns. ‘Diary Poem: Uses of Frank O’Hara’, for instance, serio-comically intervenes in a minor brouhaha regarding a review of an earlier collection by Maiden. The poem, in part a consideration of poetry and influence, manages to rhyme ‘the haka’ with ‘O’Hara’; just one instance of the linguistic playfulness within Maiden’s apparently prosaic poetics. The fantastic dialogues between political figures and their (deceased) mentors – which first appeared in Pirate Rain (2010) – also continue in Drones and Phantoms. The subjects of these poems simply ‘wake up’ in banal or comically unlikely locales. In ‘Hillary and Eleanor 10: The Coppice’, for example, ‘Hillary Clinton woke up on Wimbledon Common / in the late nineteenth century’. In the poem that follows, ‘“So That’s Who Those Motorbikes Were”’, Mother Teresa wakes up next to Princess Diana on that same Womble-infested heathland. The George Jeffreys series – first begun in Friendly Fire (2005) – carries on here, too, with George and his partner Clare appearing in increasingly cinematic action-adventures. There are also a number of short lyrical pieces, notable for their strangely disquieting effects. 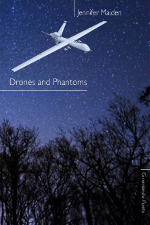 The plethora of public figures (and the issues they bring forth) in Drones and Phantoms illustrates the tendency in Maiden’s poetry – present at least since Mines (1999) – to find poetic subjects in the public discourses of the media. Maiden’s poems often find their source in news stories: comments by politicians; political stories and anecdotes; current ‘issues’ ; and they are explicitly concerned with the mediated condition of public events, a mediation that consequently effects our own private, subjective experience of those events. As Jahan Ramazani’s Poetry and Its Others (2013) illustrates, poetry might always be said to be in dialogue with its ‘generic others’, though to conspicuously draw attention to this dialogue is a particular feature of many postmodern poets. In Australia, one thinks of John Kinsella and Ken Bolton. Maiden’s use of media flows is notable for its attraction to the fantastic. Her playful transformations of media stories make clear that her poems are not ‘simply’ personal or poetic renderings of the news. In this respect, she is not unlike the Māori poet Robert Sullivan, who similarly fuses the public and the private via the (often comic) use of the fantastic. Like Sullivan, though, Maiden’s transformations are not ‘merely’ comic. As Bridie McCarthy writes, Maiden ‘makes it her prerogative to editorialise within her poetry, achieving an elegiac journalism’.1 To achieve such a putatively oxymoronic thing is no small feat. In the long argument between poetry and the news, journalism has conventionally been seen as a debasement of language, while poetry has been seen as its apotheosis. As Maiden’s poetry illustrates, the distinction is facile, and her ‘elegiac journalism’ realises the affective potential of something – the news – that is conventionally thought of as ephemeral reportage. To write ‘elegiac journalism’ is to link the intimately personal with the impersonally public. Maiden’s project, it seems, is to insert intimacy into those distances (countries, detention centres, wars) to which the news draws attention, while denying intimacy with the human subjects to be found in those distant places. As Maiden’s poems show, those subjects also range across great social distances, from asylum seekers and the poor, to politicians and celebrities, and they share a strangely distant intimacy in the virtual space called the media. It makes sense, then, that Maiden’s poems of intimate distances (one of the poems in Friendly Fire is called ‘Intimate Geography’) are poems, one way or another, of dialogue: of politicians with their predecessors; of the poet with her daughter; of the poet’s present self with her past self; of fictional characters with the real world. In the dialogues between politicians and their supposed mentors, distance is often thematically central to the poem. For instance, in Drones and Phantoms, Tony Abbott, the author of The Minimal Monarchy, appears hilariously in dialogue with Queen Victoria: ‘“Mam,” / he implored, “I do not despise women,” since / she looked motherly not minimal and seemed / to understand him with her owlet gaze’ (‘Victoria and Tony 1: A Useful Fan’). The gaze between two people is surely the most intimate of distances, and in ‘Victoria and Tony 3: Woods and Feathers’, Victoria comically knights Abbott in Port Moresby, one of those ‘distant’ places that feature in Maiden’s recent work. Abbott describes the place as ‘a gaol’ he has inherited, a place he will settle inmates, ‘if any refugee / be genuine’. This entry was posted in BOOK REVIEWS and tagged David McCooey, Jennifer Maiden. Bookmark the permalink.